Baldvin Ingvar offers a discount of 50% on their first / introductory lesson! In July 2016 I earned my Masters degree at the Royal College of Music on Clarinet. I started playing the clarinet at the age of 8 and have never turned back. When I was 15 years old I was appointed the principal clarinet of the two major youth orchestras back home, in Iceland. I held that position for 5 years. I finished my BMus degree in the Iceland Academy of the Arts and received the prestigious "Halldór Hansen" award, which is awarded to the two most promising graduates. The year after I moved to London to begin my MPerf degree at the Royal College of Music. 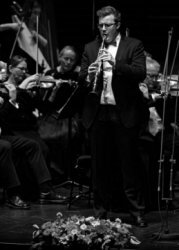 In January 2018 I moved to Iceland, for 6 months, to play bass clarinet for the Iceland Symphony Orchestra. At the age of 15 I starting playing the guitar and quickly achieved good control of the instrument. I have performed across all Iceland, with different folk/pop/rock bands. Even though I´m from Iceland, my English is great and I have never had any trouble at all expressing myself to a student. Clarinet: I started teaching 12-15 year old students, at the age of 18. Two years later I moved to a bigger music school where I expanded my client base and taught children of all age, 5-16. I´ve been teaching here in London for the past year, as a part-time job with my studies. Guitar: I began teaching in 2013 when I was working in a youth center in Reykjavík, Iceland. Mostly teaching pop and rock songs to teenagers. Since January, 2016 I´ve been teaching beginners on guitar with god success. As a teenager I worked in summer camps, worked as a football coach and a scout leader. So I have a lot of experience when it comes to working with chilren. First and foremost I want the student to have fun. I strive to make every single student the best musician they can possibly be, without risking their love and enthusiasm of the instrument. Every student is different, so it is important to fit their needs as an individual. Reply from: Baldvin Ingvar: Thank you for your kind words Fabiana. It has been great teaching Daniel for the past few weeks. I look forward to work with him even more and see him grow and develop into a good musician.